Boarding the MS Midnatsol, the first thing we see is a tall Norwegian woman welcoming us on to the ship. The second spectacle is of a tall English woman being stretchered off the ship. "She slipped and fell on the ice," reports one of the crew. Instinctively, I want to crawl. Happily, the lady reappears several days later, smiling but in a wheelchair. Norwegian winter cruising, it appears, has a touch of the blood sport about it. Forget bikinis and sun loungers: there's a layer of difficulty travelling in the far northern winter. Actually, there are many layers. Going outside for anything more than a quick photo on the promenade deck becomes an epic exercise in wrestling with thermal underwear. And two pairs of socks. Fleece. Waterproof jacket. And the boots with ice grips (hmmmm - the casualty). Crown it all with a tight beanie that will resist the wind's insistent fingers. Some people even pull on a balaclava, but that's all just a little too Douglas Mawson for me, though I am sporting a dangling pompom that holds a 90-degree angle to my head in prevailing winds. We do it because we're hunting the light: the Northern Lights. Yes, there's reindeer sledding, midnight concerts and hot tubbing on the top deck while it snows. But right now, our sun is in the midst of exceptional solar activity, and boffins say that this winter and next are the best in a decade to see the elusive Aurora Borealis. Norway is one of the world's top viewing locations and doesn't require frostbitten fingers, drinking sterilised wee or eating your own dogs to get there. In fact, it's all rather civilised on the Midnatsol, one of 12 Hurtigruten ships that undertake an 11-day round trip that traverses the length of the Norwegian coastline. A ship sails every day. The coastal express mail and goods run started in 1893, with passengers hopping on and off between farming villages and port towns. 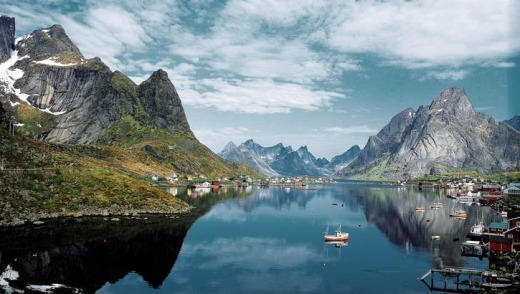 Norwegians still use the Hurtigruten as public transport, but they are now outnumbered dramatically by tourists keen to cruise the fiords and wild coastline as the ship pushes up into the Arctic Circle. There's a healthy showing of Aussies among them, forsaking a southern summer for temperatures so low, the locals don't even bother to say "minus". You can pick the Norwegians: they're the ones glued to the live chess tournaments on the television in the main lounge, silently sculling black coffee from tall thermo-mugs. The rest of us have our noses stuck to the ship's panoramic windows, waving at fishing trawlers and making such blindingly obvious statements as "Gosh, it's cold!". Doing nothing to dispel opinions of Norwegians as a teensy bit boring, Norway's national TV station NRK's home-grown programs includes 12-hour documentaries on stacking firewood, knitting and a minute-by-minute program of the Hurtigruten journeying down the Norwegian coastline, from Bergen to Kirkenes. It was a 134-hour, non-stop broadcast, and it rated! "Did you see the program?" the urbane concierge at Oslo's beautiful Grand Hotel asked me several days before boarding. "It was great!" His patriotism makes me almost forgive Norway for being so expensive that it makes my muscular Aussie dollars wimper and hyperventilate. Back on the ship, it's time to throw out all my cruising expectations: there are no little towel animals at the end of the bed each night, the theatre hosts astronomy lectures instead of chorus girls, and all the staff are locals. But hey, it does a mean buffet. Scandinavians invented the smorgasbord. The Norwegianised breakfast buffet features caramelised cheese, mustard herrings and salmon done three ways (roasted, smoked, cured) every morning. There's reindeer pate and cloudberries at lunchtime and a local salmon served, classically, with dill steamed potatoes at dinner. And yes, there is a gift shop, full of hideously misshapen trolls and heart-breakingly expensive snowflake knits. The Hurtigruten is undeniably Norwegian. The total journey from Kirkenes to Bergen is 2465 kilometres, stopping in at 33 ports, some as little as 15 minutes, just long enough to sling a crate of parcels overboard. After a few days, we slip into the routine of busy mornings exploring towns and afternoons of quiet contemplation and panoramic viewing. It's dark by 4pm but we don't care: we're here to see the light. The Japanese say a baby conceived beneath the lights is a special child. The Sami believe the lights are a trail left by a fox scampering across the sky. Everyone from ancient Chinese to American Indians have a theory: the lights are souls, they're a bridge to heaven, a good omen, a bad omen. But let me blow a few myths: if you were standing on deck in sub-zero temperatures at midnight waiting for a ray of green light to zap you between the eyes, you'd be waiting a long time. Guest lecturer and British astronomer Dr John Mason says most of the colours in the Northern Lights are invisible to our eyes: we just can't see the red and turquoise bands with the naked eye. "You probably won't see colour, but you will see movement." Green is the most apparent colour, followed by violet, but even then they'll most likely show up as a hazy grey cloud against the clear black sky, he warns. Point a camera at the grey clouds and you'll see the eerie green rays appear in your final photo - and even then only when you open the lens for up to 15 seconds or more. To see the lights, the sky has to be dark, with no light pollution. You also need a cloudless sky and your eyes also need to be dark adapted, which can take up to 10 minutes, which is a long time on a windswept ship's deck in the black of a polar night. "When the lights appear, we'll make the announcements over the ship's PA, and you have to hurry," Dr Mason says. "We don't know how long they'll last - You've got to be ready." We're all so ready. "We've been on six nights, from Bergen, and haven't seen anything yet," says glass artist Bob Stephan, from North Carolina. Armed with a fish-eye lens and balaclava, he helps me lash my camera to a deck chair in lieu of my lost tripod. There are two important things to note from this conversation: one is that most tourists tend to stay on the ship for the entire 11-day round journey, from Bergen up to Kirkenes and back again. The second is that the Northern Lights are fickle. But we strike it lucky: second night on board, and the show is on. The deck is jam-packed as people point cameras to the sky. The sky swirls and a soft grey-green light gusts and drifts into view. It's not the "hit-me" colours of the brochures, or a white night. But the wild wind, the snow gusts and the dancing sky leave us light-hearted and light-headed: we are but mesmerised little people dwarfed by the glory above. The serious photographers are rugged up and settled in for the night, but the crowd drifts off after an hour or so. The next night, the lights show even longer, a static display that has the astronomers scratching their heads, though the ship is pitching wildly. It's also cold enough to bite your nose off. We dash down below decks to thaw out, when one of the astronomy tour members, Patch, pulls out his phone. The Aurora Australis has been putting on a spectacular show in Tasmania, just an hour and $100 from my Melbourne home. Groans from we Australians. Tasmania? That's next year's plan. Norwegian Getaway has a three-storey sports complex that includes an eight-foot over-sea "walk the plank". The Aurora Australis has been seen as close to Hobart as Seven-Mile Beach (near Hobart Airport), on the Overland Track and Bruny Island. Get viewing tip-offs from this local alerts page facebook.com/groups/215002295201328/. Fairbanks and nearby Denali National Park are Alaska's playground for aurora hunting, and boast an 80 per cent chance of spotting the lights from August to April, see explorefairbanks.com. Make sure you're in the glassed-in bar of the Ion Hotel when the lights deign to shine. The new eco-hotel is an hour's drive from Reykjavik, see ioniceland.is. Head for Whitehorse, Yukon, on the edge of the wilderness and hunker down in a yurt while you wait for the performance to begin, see arcticrange.com. Tuck up in a snow igloo in Kakslauttanen Arctic Resort, in Finnish Lapland, a thousand kilometres north of Helsinki, see kakslauttanen.fi. Fly Sydney to Oslo via Bangkok with Thai Airways or via London with British Airways (britishairways.com). From London or Bangkok, book early to catch Norwegian Air's cheap flights (norwegian.com). 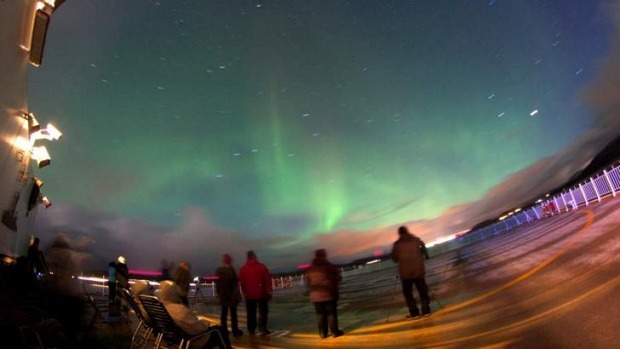 The nine-day Best of Norway Cruise departs daily from Bergen or Kirkenes, with astronomy tours available in winter. From $2877, twin share (winter) to $4448 (summer), 1800 221 712, see bentours.com.au.